Jeremiah 30: 1-2, 12-15, 18-22. Psalm 102: 16-21, 29, 22-23. The Eighteenth Tuesday of Ordinary Time. The Memorial of the Dedication of the Basilica of Saint Mary Major. Those of you who have visited my personal web site have seen that part of it called “Father Michael's Radio Theater," where I'm currently broadcasting episodes from a radio series of Sherlock Holmes adventures from the late 1940s, and usually provide something about the Sherlock Holmes stories with each weekly episode. I read all of Arthur Conan Doyle's stories growing up; and, whenever there’s a new dramatization of one on TV or the movies, I always see it. But as I’ve gotten older, I’ve reread those stories with a more critical eye, and realized that Sherlock Holmes wasn’t as smart as I originally thought he was. After all, it’s no trick for a mystery writer like Doyle to make his detective seem brilliant when he’s made every other character in the story an idiot. Holmes always solves the case, but he does so amid an entourage of bumbling policemen and his own friend and biographer, Watson, who can’t seem to see the fog for the weather. And it occurs to me that I get that same feeling whenever I read this passage about our Lord walking on water and calming the sea. They’re all amazed at this feat; and it’s almost as if, up to this point, our Lord has given his disciples no indication that he is in any way Divine. Except that just prior to this, our Lord fed 5000 men on the hillside. Last Sunday we read that passage of our Lord feeding five thousand men with a handful of food. That’s a pretty good card trick. And it’s not the first time he’s done that. You would think that, by this time, our Lord’s disciples would understand that this Jesus fellow is different, and that they shouldn't really expect to be surprised by anything. And that passage ends, you’ll recall, with our Lord sending his disciples in the boat to the other side of the lake, while he stays behind to pray. 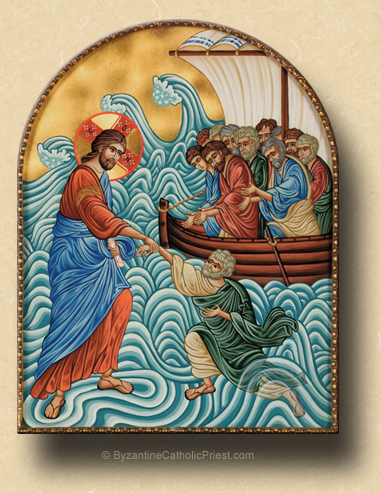 That passage is repeated in the beginning of today’s Gospel, which recounts our Lord walking across the lake to them and calming the sea. So, why are they surprised to see our Lord commanding nature? Why haven't they gotten the message that Jesus is God, even in spite of our Lord continually showing them? And I think the answer might be a defect of our fallen nature which is shared by all of us: we resist accepting the reality of things which don’t fit our predetermined view of the world. And this can be a real hindrance in our interior life; because, if there’s anything that makes a barrier to spiritual growth and union with God, it’s the inability to deal with the unexpected. I don’t think you could find a priest ordained for any length of time who will tell you that the priesthood is exactly what he thought it would be when he was in the seminary. And you can judge for yourselves how accurate was your prediction of what marriage would be like when you were engaged. Not to suggest that how it turned out is bad, but I think you’ll admit that it’s certainly different in many ways. But our ability to adjust our expectation is what enables us to persevere in these vocations—and not only persevere, but make them even more special than we had imagined. In the interior life, if our hearts are not open to accepting whatever the Lord chooses to throw our way, we run the risk of ending up bitter and frustrated, and in danger of losing our faith. As a priest I see this pattern repeated in people’s lives again and again: the Church will teach something that pertains to what we must do or not do to be saved; and because it doesn’t fit our plan—because we view it as too much a burden—we just reject it, as if we, ourselves, are the measure of all things. Maybe we tried but failed, and we don’t like to think of ourselves as failures, so we declare that what the Church requires is wrong because we, after all, are perfect. But who is the person who tries something once then quits. We usually call that person a loser. Failure in our duties to Christ and his Church are certainly serious things, but they are not totally unexpected, which is why our Lord instituted the Sacrament of Confession. Confession would have no place in the Church were it not for the fact that a certain amount of failure is expected. What’s important is not that we never fail, but that our failures do not become occasions of bitterness and rejection of the truth, but rather of self-examination and improvement. Sherlock Holmes, if you remember from your childhood reading, failed in his very first case. If he had simply given up detection and become an accountant instead, that would have been the last story in the series, and a pretty lousy one at that. He chose, instead, to learn from his mistakes, and he never failed again. Peter, in the Gospel lesson, doubted our Lord and began to sink into the water; but, after our Lord bailed him out (no pun intended), he learned something, and made his confession of faith saying, “Truly, you are the son of God.” And even then, we can’t say that he never failed again, because he did fail when he denied our Lord three times on Good Friday. But even these repeated failures didn’t turn our Lord’s heart against him. And the Lord’s heart will never be turned against any of us, so long as we never stop trying. Maybe the Lord hasn’t dealt with us the way we thought he should. Maybe we’ve been surprised or even hurt by what we perceive to be the hand dealt to us by God. But the mind of God is not ours to know. The heart of God we know already; and, knowing that can make every obligation and burden for the sake of Christ possible. * Those who have read the adventures of Sherlock Holmes by Sir Arthur Conan Doyle will, no doubt, know that this phrase is never actually said by Holmes in any of the original stories. ** During the reading of cycle A of the Dominica, this Gospel lesson is also read on the following Sunday, the Nineteenth of Ordinary Time; thus, the Missal provides an alternate lesson for today, Matthew 15: 1-2, 10-14, the reading of which is optional. Since Father has not scheduled himself to preach this Sunday, he has elected not to excercise this option. *** "When Liberius was Pope, a Roman Patrician named John, and his wife, also of noble birth, having no children to inherit their goods, vowed their inheritance to the most holy Virgin Mother of God. The blessed Virgin heard their prayers and approved their vow by a miracle. On the 5th of August, which is always the season of the greatest heat in the City, snow fell by night and covered part of the Esquiline hill. And on that same night, the Mother of God told John and his wife separately in dreams that they should build a church on that place. When John told this to Pope Liberius, he said that he had had the same dream. The Pope therefore went to the snow-covered hill and there marked out a site. The church was built with the money given by John and his wife, and was later restored by Sixtus III. It has been given various names; but, so that its title may indicate its excellence, it is called the church of St. Mary Major." And, if you've ever been privleged to assist at Holy Mass in this basilica in Rome on this day, they have the lovely custom of remembering the miraculous August snow fall by dropping flower petals from the ceiling onto the congregation during the singing of the Gloria.